The National Institute on Aging released a study that concluded that calorie restriction in rhesus macaques (macaca mulatta) does not extend lifespan. This research and the reporting of it are both problematic. Thus, the CR Society International and Livingthecrway.com collaborated to provide another perspective on the effects of calorie restriction in nonhuman primate studies. Rhesus macaques are found in Afghanistan, Pakistan, India, Southeast Asia, and China. Their natural diet includes roots, fruit, seeds, and bark – as well as insects and small animals. They live in troops that can include up to 200 animals. In the wild, their average lifespan is four years1 -- vastly different from their lifespans in captivity that average 26 years.2 Because of their biological similarity to humans, rhesus macaques have been thought to be ideal research candidates to test the ability of calorie restriction to prevent disease and extend lifespan. Three published studies consider the effects of calorie restriction on the lifespan and healthspan of rhesus monkeys. We report here that a CR regimen implemented in young and older age rhesus monkeys at the National Institute on Aging (NIA) has not improved survival outcomes. Our findings contrast with an ongoing study at the Wisconsin National Primate Research Center (WNPRC), which reported improved survival associated with 30% CR initiated in adult rhesus monkeys (7-14years) and a preliminary report with a small number of CR monkeys. Over the years, both NIA and WNPRC have extensively documented beneficial health effects of CR in these two apparently parallel studies. The implications of the WNPRC findings were important as they extended CR findings beyond the laboratory rodent and to a long-lived primate. Our study suggests a separation between health effects, morbidity and mortality, and similar to what has been shown in rodents study design, husbandry and diet composition may strongly affect the life-prolonging effect of CR in a long-lived nonhuman primate. Nutrient concentrations were based on published estimates of requirements for nonhuman primates (NRC 1978) and on previous experience with commercially available NHP diets. The approximate macronutrient composition (by weight) was 15% protein, 5% fat, and 5% crude fiber, with a gross energy density of 3.77 kcal/g. Standard vitamin and mineral premixes added to the diet were increased by 40% to guard against possible deficiencies when the diet was fed in reduced amounts. All the animals also received a low-calorie treat daily and fresh fruit on a weekly schedule. Colman RJ, Anderson RM, Johnson SC, Kastman EK, Kosmatka KJ, Beasley TM, Allison DB, Cruzen C, Simmons HA, Kemnitz JW, Weindruch R.
We report findings of a 20-year longitudinal adult-onset CR study in rhesus monkeys aimed at filling this critical gap in aging research. In a population of rhesus macaques maintained at the Wisconsin National Primate Research Center, moderate CR lowered the incidence of aging-related deaths. At the time point reported, 50% of control fed animals survived as compared with 80% of the CR animals. Furthermore, CR delayed the onset of age-associated pathologies. Specifically, CR reduced the incidence of diabetes, cancer, cardiovascular disease, and brain atrophy. These data demonstrate that CR slows aging in a primate species. but the restricted diet is supplemented with an additional 30% of the vitamin and mineral content to ensure that the groups, on average, consume a similar amount of micronutrients. Mortality and morbidity in laboratory-maintained Rhesus monkeys and effects of long-term dietary restriction. Bodkin NL, Alexander TM, Ortmeyer HK, Johnson E, Hansen BC. Mortality and morbidity were examined in 117 laboratory-maintained rhesus monkeys studied over approximately 25 years (8 dietary-restricted [DR] and 109 ad libitum-fed [AL] monkeys). The age at median survival in the AL was approximately 25 years compared with 32 years in the DR. The oldest monkey was a diabetic female (AL) that lived to be 40 years of age. These results suggest that dietary restriction leads to an increased average age of death in primates, associated with the prevention of hyperinsulinemia and the mitigation of age-related disease. commercial monkey chow (Purina Mills, St. Louis, Missouri) composed of 17% protein and 13% fat by weight. Some of the control monkeys were occasionally fed a liquid diet (Ensure, Ross Laboratories, Columbus, Ohio) for related studies. All monkeys received a chewable multivitamin daily and fresh tap water was freely available. https://www.crsociety.org/index.php?/files/download/21-monkey-housing-conditions/ in the NIA study. Tung J, Barreiro LB, Johnson ZP, Hansen KD, Michopoulos V, Toufexis D, Michelini K, Wilson ME, Gilad Y. Variation in the social environment is a fundamental component of many vertebrate societies. these results illuminate the importance of the molecular response to social conditions, particularly in the immune system, and demonstrate a key role for gene regulation in linking the social environment to individual physiology. Despite the important effects that social interaction has on their health and well being, the monkeys in these studies are not given the opportunity to interact with others. Exercise is not part of the regimen of the monkeys in any of the nonhuman primate studies examined here, even though moderate exercise is well documented to be important for health and long life in human primates11. In fact, exercise activates the ancient energy sensor adenosine monophosphate kinase (AMPKinase)12, a major facilitator of calorie restriction benefits13. The sedentary lifestyle of the rhesus monkeys in the studies would make activation of this biochemistry unlikely. The following chart shows how calorie restriction, low glucose levels, moderate protein intake, and exercise affect ATP AND AMPK levels to get the the widely reported calorie restriction benefits14. [T]here is deep divergence in mitochondrial and nuclear genomes between Indian and Chinese rhesus, including sequences for the major histocompatibility complex (Kanthaswamy et al. 2008). Phenotypic differences, including behavioral differences such as less aggressiveness in Indian versus Chinese rhesus, have also been reported (see Kanthaswamy et al. 2008). "The [NIA] group that underwent CR in early adulthood exhibited increased activity, particularly oral behaviors and rocking (usually regarded as manifestations of neurosis), compared to the younger groups. Interestingly, animals exhibiting stereotypies were those imported from China, suggesting that the behavioral difference may have a genetic basis or result from different early experiences. "Stereotypical behaviors are thought to be caused ultimately by artificial environments that do not allow animals to satisfy their normal behavioral needs. Rather than refer to the behavior as abnormal, it has been suggested that it be described as 'behavior indicative of an abnormal environment. [1 Stereotypies are correlated with altered behavioral response selection in the basal ganglia. As stereotypies are frequently viewed as a sign of psychological distress in animals, there is also an animal welfare issue involved." Self-injurious biting, which occurs in approximately 10% of cases when monkeys are housed singly15, was not reported by any of the research groups. The NIA study reported that two young male CR monkeys died of heart failure. According to Kemnitz, this cohort was affected by stereotypic behavior16. After 6 years of CR the NIA monkeys were videotaped in their home cages and scored for a range of locomotor, self-directed, and other behaviors (Weed et al. 1997). The group that underwent CR in early adulthood exhibited increased activity, particularly oral behaviors and rocking (usually regarded as manifestations of neurosis), compared to the younger groups. Interestingly, animals exhibiting stereotypies were those imported from China, suggesting that the behavioral difference may have a genetic basis or result from different early experiences. Does calorie restriction extend life in primates? Despite issues with housing conditions, dietary intake, and monkey selection approaches – two of the three long-term studies confirm life extension benefits for calorie restriction, as defined by the investigators. In the full letter, the NIA researchers speculate about confounding variables that may have caused their study not to show a longevity benefit for the calorie restriction cohort. The NIA-1-87 formulation (Labdiet, PMI Nutrition International) has a natural ingredient base whereas WNPRC diet is purified (Harlan Teklad). Although natural ingredient diets risk having some variation between batches, they contain components that may have an impact on health such as phytochemicals, ultra-trace minerals and other unidentified elements. In purified diets, each ingredient supplies a specific nutrient and each required mineral and vitamin is added as a separate component. a. Protein was derived from wheat, corn, soybean, fish and alfalfa meal for the NIA diet, whereas the WNPRC diet protein source was lactalbumin. b. The NIA diet also contained flavonoids, known for their antioxidant activity. c. Fat from soy oil and the oils from the other natural ingredients (that is, corn, wheat and fish). Fish meal contains approximately 8–12% fat and is rich in omega-3 fatty acids. In the WNPRC study dietary fat was derived from corn oil. d. Carbohydrate content was also notably different; although both diets had 57–61% carbohydrate by weight, the NIA study diet was comprised primarily of ground wheat and corn, whereas the WNPRC study diet contained corn starch and sucrose. Indeed, the WNPRC diet was 28.5% sucrose, whereas the NIA study diet was only 3.9% sucrose. This latter point may be particularly important as a diet high in sucrose may contribute to the incidence of type II diabetes. The NIA study used the same diet for both CR and control monkeys. This diet was supplemented with an additional 40% of the daily-recommended allowance to insure adequate nutrition for the CR monkeys. Thus, the NIA diet formulation super-supplemented the control monkeys. The WNPRC study fed two different diets and only the CR monkeys were supplemented. Further, the NIA study control monkeys were not truly fed ad libitum, unlike the WNPRC study. The regulated portioning of food for the NIA control monkeys may be a slight restriction and, thus, largely prevented obesity. Studies of 10% CR have been reported to increase lifespan in rats compared to ad libitum controls – even more than 25% and 40% CR20. The NIA control monkeys may experience survival benefits from this slight restriction. Calorie restriction effectively lowered body weight in the NIA and WNPRC monkeys. However, WNPRC monkeys generally weighed more than corresponding NIA monkeys. For example, at 17 years of age, WNPRC males weighed approximately 12% more than corresponding NIA males and the difference was approximately 18% for the females. Thus, the NIA monkeys may be in an optimal weight range. NIA monkeys originated from China and from India and have greater genetic diversity, compared to the strictly Indian colony at WNPRC. As in rodent studies, the age of onset of the CR regimen for the two studies would as likely have had an impact on survival outcomes as it has on other measures: CR initiated in the youngest male monkeys delayed maturation and slowed skeletal growth. Additionally, only the immune response of the adolescent males was improved by CR. This study in question showed many odd features that make me think that it might not represent the truth of the matter. The study incorporated monkeys that had previously been used in military research and 20 out of the 26 animals seemed to die before age of 12 years. In order not to taint the research, they tagged the results with an origin label and then adjusted to remove these animals. Could this have had an effect on the other animals too that was not controlled for? Twenty of the 26 adult-onset females were obtained from a military research facility, and 19 of these monkeys developed severe and rapidly progressing endometriosis. The twentieth monkey of this group died at the age of 12 years from renal necrosis. It seemed apparent that this cohort was differentially affected in terms of long-term health, and thus, an indicator variable that designated the source of this monkey group as Aberdeen™ was created and was included in most analyses to control statistically for the effects of these animals on the outcomes of interest. Lane MA, Ball SS, Ingram DK, Cutler RG, Engel J, Read V, Roth GS. American Journal of Physiology. 1995 May;268(5 Pt 1):E941-8. Edwards IJ, Rudel LL, Terry JG, Kemnitz JW, Weindruch R, Cefalu WT. The Journals of Gerontology. Series A: Biological Sciences and Medical Sciences. The female animals did not live as long as the male animals in either CR or control group. This is contrary to what we experience in humans where females average 5+ years more than males. The studies of calorie restriction in primates began in 1987. They were undertaken because of the biological similarities between humans and other primates. However, neither the dietary protocols nor the housing conditions used in these studies would be acceptable for human calorie restriction research. ... Studies of CR and aging using nonhuman primates (rhesus monkeys) have been ongoing for several years at the National Institute on Aging and the University of Wisconsin-Madison.
. For example, monkeys on CR weigh less and have less body fat. Monkeys on CR also exhibit lower body temperature, fasting blood glucose and insulin, and serum lipids. In addition, insulin sensitivity is increased in monkeys on CR. Recent efforts in the NIA study have focused on the effect of this intervention on risk factors for various age-related diseases, in particular for diabetes and cardiovascular disease. We have shown that monkeys on CR have lower blood pressure, reduced body fat, and a reduced trunk:leg fat ratio. Also, monkeys on CR have reduced triglycerides and cholesterol and have increased levels of HDL2B. Low levels of this HDL subfraction have been associated with increased cardiovascular disease in humans. In short-term studies, older (> 18 years) monkeys on CR exhibit reductions in insulin and triglycerides before changes in body composition and fat distribution became evident. These and other findings have suggested that CR might have beneficial effects on certain disease risk factors independent of reductions in body weight or prevention of obesity. It is critically important to closely monitor and report intakes along with experimental outcomes to enable appropriate interpretation of the data. It can be misleading to describe consequences of “30% restriction” when that is only the intent, whereas in fact the difference between control and experimental groups is either not known or is something less. Also, animals’ intake is not truly restricted if they are not routinely consuming all their allotted food. actually restricted according to the defined goal (e.g., 30%). A related point pertains to effects of short-term (hours) versus chronic restriction. Some measures, such as growth hormone and cortisol (glucose counter regulatory factors), can be markedly elevated after fasting and changes or differences in levels may be a function of time since the last meal rather than sustained outcomes of CR. It is important, therefore, to standardize the period of fasting between groups before measuring labile endpoints and to consider integrated measurements over longer periods of time (e.g., 24-hour measurements). This response was written by Paul McGlothin, Vice President Research, Research@CRSociety.org, and Meredith Averill, Board Chair, Boardchair@CRSociety.org, the CR Society Intl. We thank Dr. Joseph Kemnitz whose excellent paper of 2011 was a great help in developing this response. We also wish to thank Dr. Alan Pater and Richard Schulman for their contributions and to CR Society members for their discussion of this matter. To their credit, the researchers at the NIA and the University of Wisconsin have agreed to work more closely together. They realize that the media has misinterpreted the latest study that has been examined here and hope to correct any misunderstandings with joint papers to be issued in the coming months. See George Roth’s (one of the NIA study's originators) response to the press coverage of the Monkey Studies. 2. Ramsey JJ, Colman RJ, Binkley NC, Christensen JD, Gresl TA, Kemnitz JW, Weindruch R.(Wisconsin Regional Primate Research Center, University of Wisconsin, Madison, WI, USA). 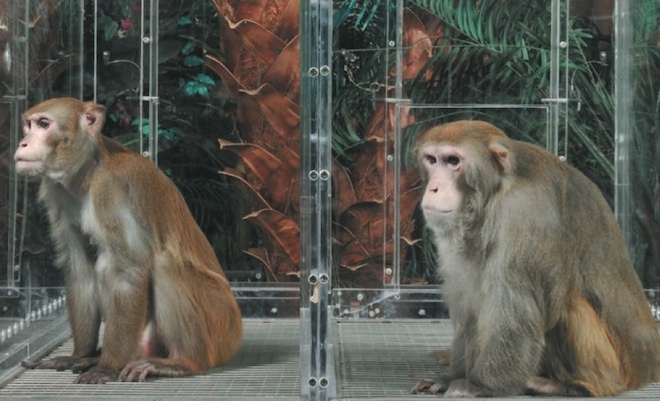 Dietary restriction and aging in rhesus monkeys: the University of Wisconsin study. Exp Gerontol. 2000 Dec;35(9-10):1131-49. 4, Kemnitz JW. Calorie restriction and aging in nonhuman primates. ILAR J. 2011 Feb 8;52(1):66-77. 5. Colman RJ, Anderson RM, Johnson SC, Kastman EK, Kosmatka KJ, Beasley TM, Allison DB, Cruzen C, Simmons HA, Kemnitz JW, Weindruch R Caloric restriction delays disease onset and mortality in rhesus monkeys. Science. 2009 Jul 10;325(5937):201-4. 6. Colman RJ, et al., Ibid. 7. Bodkin NL, Alexander TM, Ortmeyer HK, Johnson E, Hansen BC. Mortality and morbidity in laboratory-maintained Rhesus monkeys and effects of long-term dietary restriction. The Journals of Gerontology. Series A: Biological Sciences and Medical Sciences. 2003 Mar;58(3):212-9. 8. Bodkin NL, et al., Ibid. 9. Kemnitz JW., Op. cit. 10. Tung J, Barreiro LB, Johnson ZP, Hansen KD, Michopoulos V, Toufexis D, Michelini K, Wilson ME, Gilad Y. Social environment is associated with gene regulatory variation in the rhesus macaque immune system. Proceedings of the National Academy of Sciences of the U.S.A 2012 Apr 24;109(17):6490-5. 11. Blair SN, Morris JN. Healthy hearts – and the universal benefits of being physically active: physical activity and health. Ann Epidemiol. 2009 Apr;19(4):253-6. 13. Richter EA, Ruderman NB. AMPK and the biochemistry of exercise: implications for human health and disease. Biochem J 418: 261–275, 2009. 20. Mattison, et al., Op.cit. 21. Lane MA, Ball SS, Ingram DK, Cutler RG, Engel J, Read V, Roth GS. Diet restriction in rhesus monkeys lowers fasting and glucose-stimulated glucoregulatory end points. American Journal of Physiology. 1995 May;268(5 Pt 1):E941-8. 22. Edwards IJ, Rudel LL, Terry JG, Kemnitz JW, Weindruch R, Cefalu WT. Caloric restriction in rhesus monkeys reduces low density lipoprotein interaction with arterial proteoglycans. The Journals of Gerontology. Series A: Biological Sciences and Medical Sciences. 1998 Nov;53(6):B443-8. 23. Lane MA, Ingram DK, Roth GS. (Intramural Research Program, Gerontology Research Center, National Institute on Aging, NIH) Calorie restriction in nonhuman primates: effects on diabetes and cardiovascular disease risk. Toxicological Sciences. 1999 Dec;52(2 Suppl):41-8.